When I heard from Matt Siegelbaum that his son Jacob had started to cast his own figures in resin, I had one thing to say: I WANT AN EXCLUSIVE! 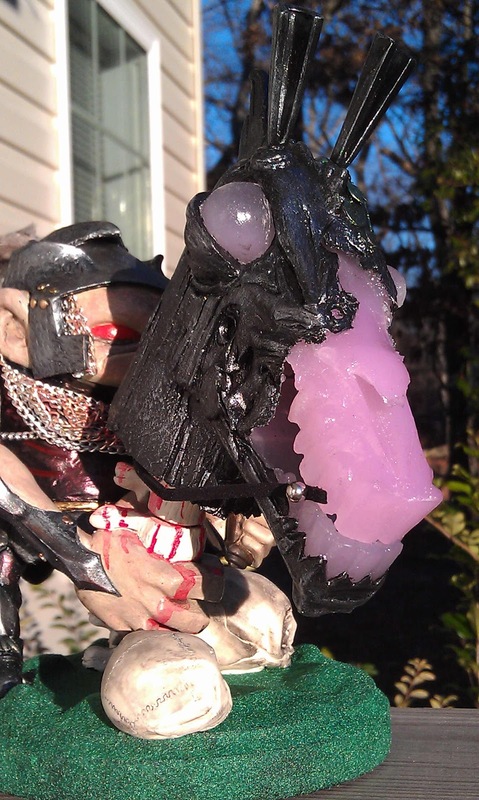 Jacob, who is 12, has had great success sculpting, molding and casting his own designs into resin. 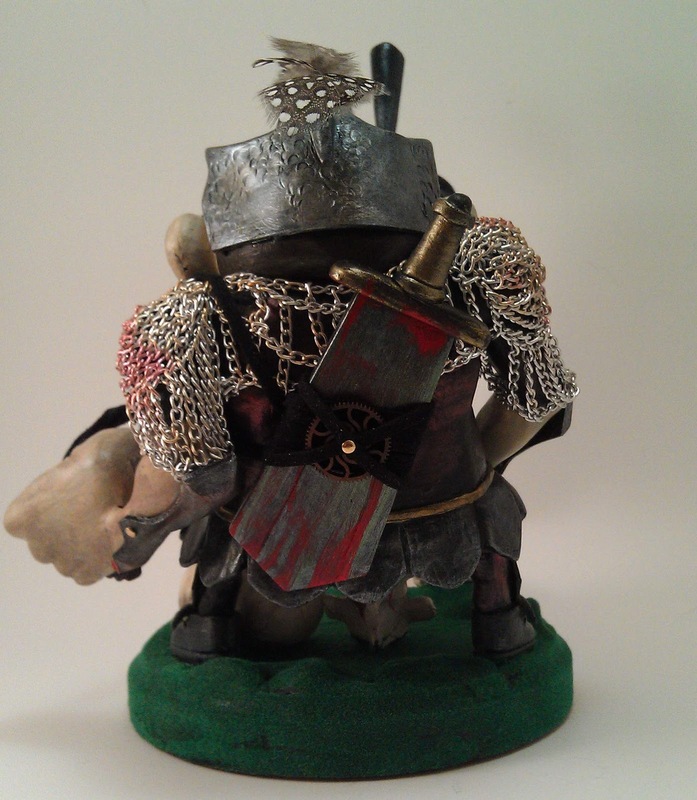 He's been selling them to classmates at school, and he has several sculpts by now. 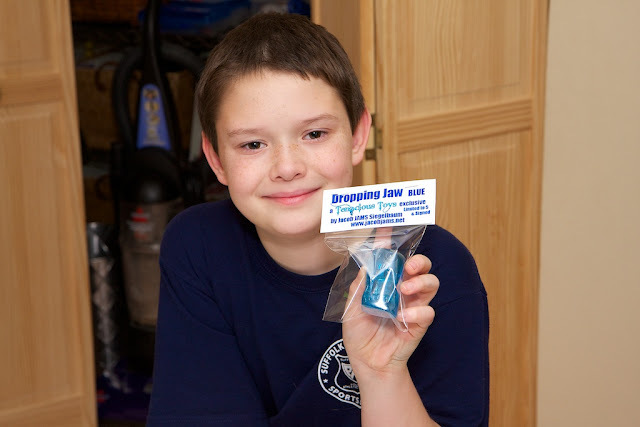 Jacob agreed to create a special Tenacious Blue Dropping Jaw Exclusive just for us! Matt and Jacob work on this project together, which is such a ridiculously cool father/son activity... I'm so jealous. Even at 33 years old, I'm jealous. I wanna do this with my dad. I'm a huge fan of productive and constructive family time, and as a toy retailer I was falling all over myself to get on board with Jacob. 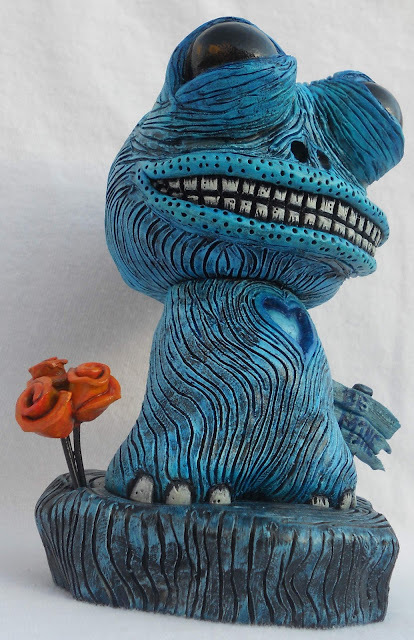 So there ya go: a sneak peek at the next Tenacious Toys Exclusive Series: the tinted blue resin Dropping Jaws by Jacob JAMS. Good thing dad (Matt) is a professional photographer- I have better shots of this piece than almost anything else I sell! I'll post full, detailed pics and more info soon. Matt Anderson was recently commissioned by a collector (Pranay) to customize a Horselington- a fascinating figure to customize as it is such a complex platform. Basically it's a little squat dude wearing a horsehead hat. Or something. It's a big piece, about 10 inches tall. I believe Rsin, Nerviswr3k and possibly Chauskoskis were also commissioned by the same collector to customize Horselingtons. Could be wrong... but I started to see Horselingtons by those guys popping up on Facebook. In any case, a different collector suggested that I cover Matt's custom. He was a big fan and wanted to see this one get some page time. I'm a big fan of anything Matt does, so here are some pics. 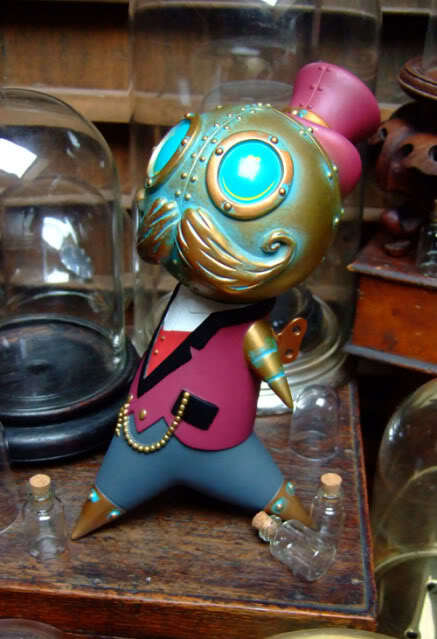 Lt. Joe “Fresh” McMinty is a custom by Don P based on the 7-inch Kidrobot Mascot platform. During a secret CryoGenicmission he was lost in the Brazilian woods in the year 2176. His crew left him for dead. He was nothing for the government and they did not search for this poor fella. His family was desperate with the loss of their dad, who was really the best dad that they could wish for. 10 Years later he finally reached a city........ Angry that he was, he wanted revenge on the people who left him for dead. Heavilly attacked by wild animals, he was signed for life. The main thing that kept him alive was his enormous drive to see his family again. You can follow Don P here: Facebook, blog & shop. Fuller sends us images of his completed Kings of Seasons Dunny Series. Not surprisingly, the finished product looks EXACTLY like his illustrations. Look at those wild colors! I'm so impressed by Fuller's work- he releases these concept illustrations and then simply carries them out perfectly. It's insane. 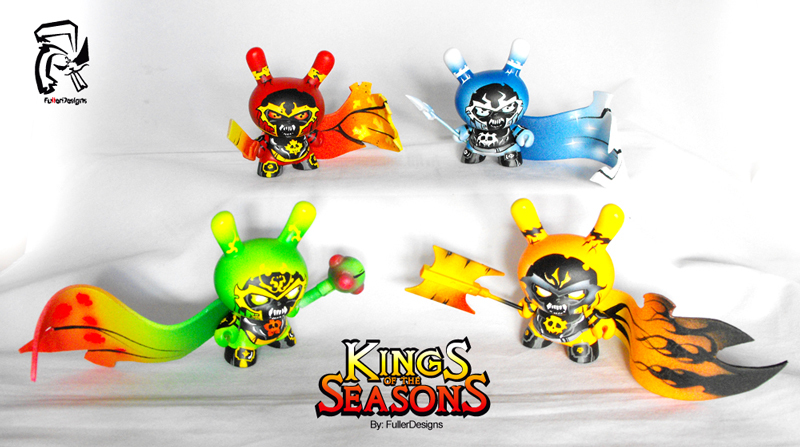 The Kings of Seasons series is sold out... sorry! Certainly worth posting about, though. If you missed these figures, keep an eye on Fuller's shop for future preorders going up. Seems to be the only way to grab some of his work. The latest and last colorway of Humphrey Mooncalf, the Entertainer, is now available for us to purchase. Price is $90. This colorway is limited to just 100 pcs and comes in an outlandish red-black suit. Email us if you want one. The Dapper colourway of Humphrey Mooncalf is now available to us again- this is the last batch left. Limited to just 250 pieces and priced at $85. Email us if you want one. 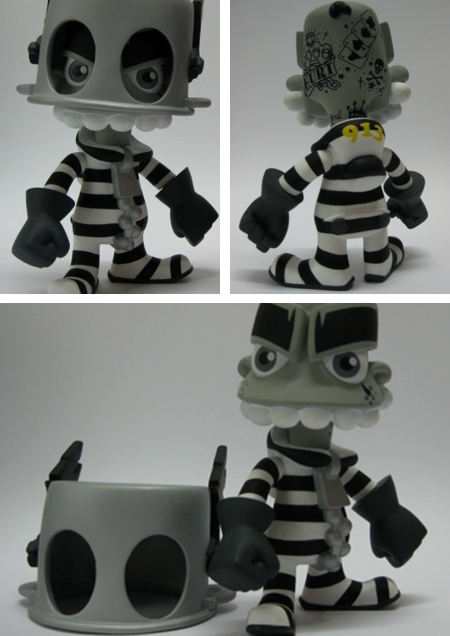 Also, the first Mork figure, Prisoner 913, is now available to us. 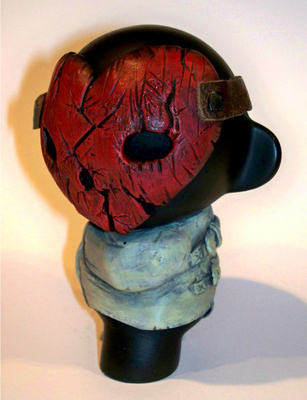 This was pre-released at NYCC 2011 and the stock brought in for that con sold out. Prisoner 913 is the good half of the Mork brothers and is decked out in a white-black jumpsuit. Limited to just 100 pcs and priced at $65- email us if you want one. How wild is this GID Rainbow Ugly Unicorn by Rampage Toys? Release is tomorrow, Friday, February 3rd in the Rampage Toys shop! 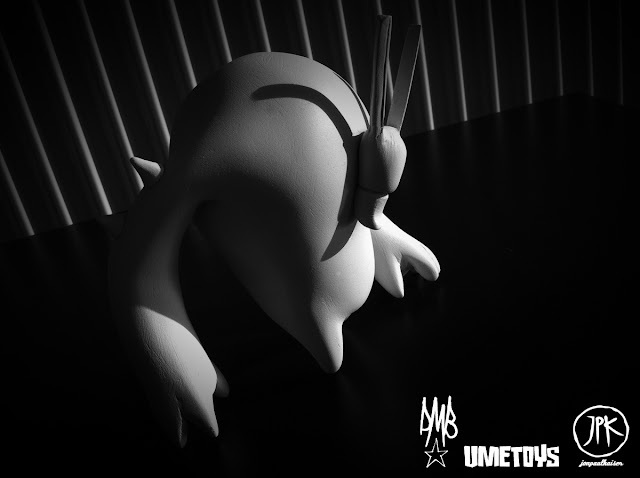 SNEAK PEEK: RunDMB x JPK x Ume Toys "Project X"
It's called "Project X" because it has no name... but look at this thing! 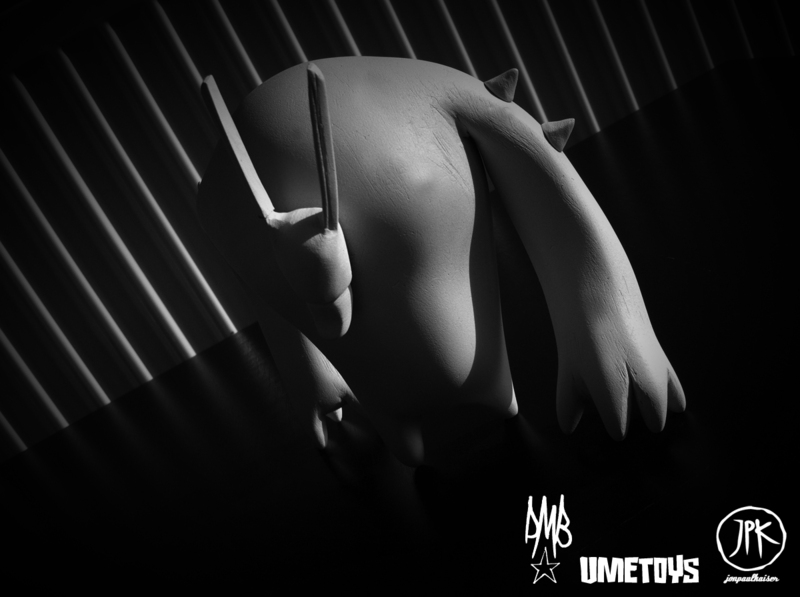 With sculpting like that, who needs a name anyway? 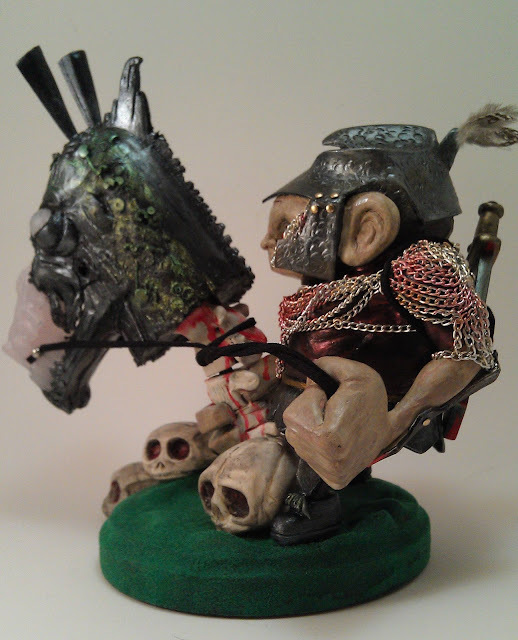 This sculpt is based on a sketch by RunDMB (David Bishop) and JonPaul Kaiser, and cast into resin by Rich Page of Ume Toys. At the tail end of last yeat I had a conversation about a possible sculpt/resin toy based on a sketch from David Bishop (@rundmb) and Jon Paul Kaiser (@jonpaulkaiser). 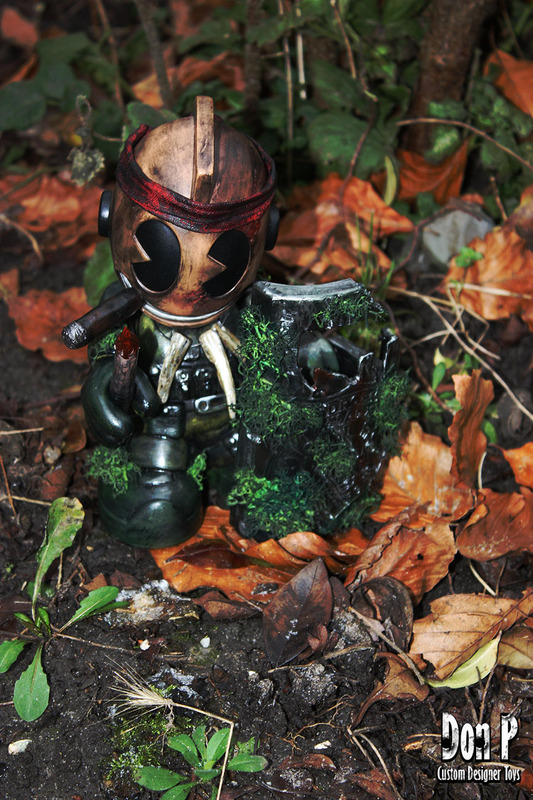 I've sculpted him up - a few tweaks to come that will include articulation for his arms and head (which will also be reshaped a little) - I took him down to KidRobot London last week and everyone seemed to like him a lot. We are thinking of a small run for ourselves and selected friends to custom and hope to put a little show on for the launch - after that a ltd run of resin blanks should be up for grabs (no prices yet). Fuller's sweet Black Magic II series releases in April- he's currently accepting preorders here. These look freaking amazing- Fuller deftly executes both the illustration and customization aspects of his product design. 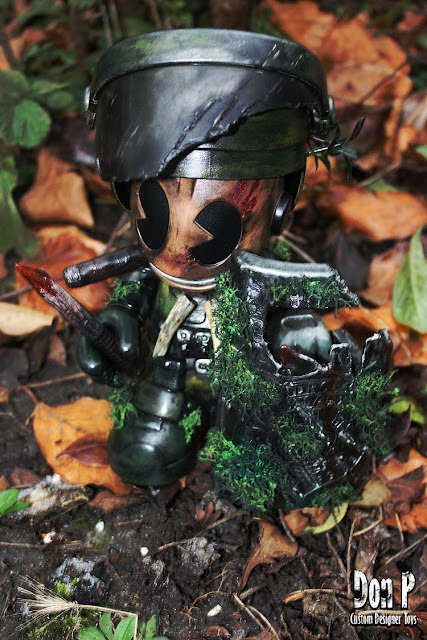 I had so much fun making the first series I wanted to do another with new characters using 3" Dunnys. Characters include Priest (variant), Shadow, Bayou Witch, Gator, and Zombie Stew. They are up for preorder in my store at only $65 each and they come with a 4"x6" print. Series releases in April 2012 and only five of each design will be made. 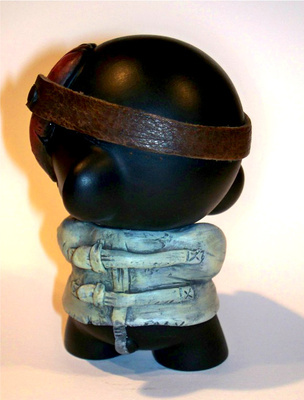 Alison (aka Miss Zukie) emailed us to show us her new line of sculptures called "Baby Zukies." Baby Zukies small 3" x 3"x 3" sculptures made of sculpey, real egg shell and hobby grass. Each comes with a case which protects the sculpture. There are only 3 available in this series: Red, Yellow and Blue. All Baby Zukies are $60 + shipping. Click the link here to go to the Zukies store. The next product is called "Zukies World" which are also small 3"x 3"x 3" sculptures made of sculpey and hobby grass with a protective case. The 3 colors available are Baby Blue, Purple and Green. All Xukies World pieces are $60 +shipping. Click the link here for Zukies World. 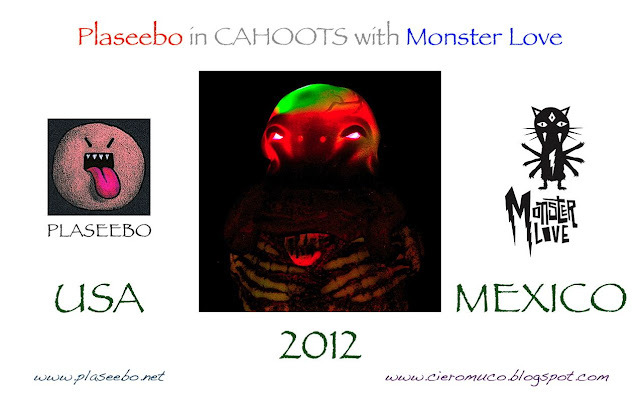 This is a lottery for the chance to purchase a unique mash-up edition of the Plaseebo Mummy from the US and The Bacteria monster from Monster Love of Mexico. Each of the 5 customs in this Ultra Limited edition has been hand built and hand painted by Bob Conge. Signed and numbered. 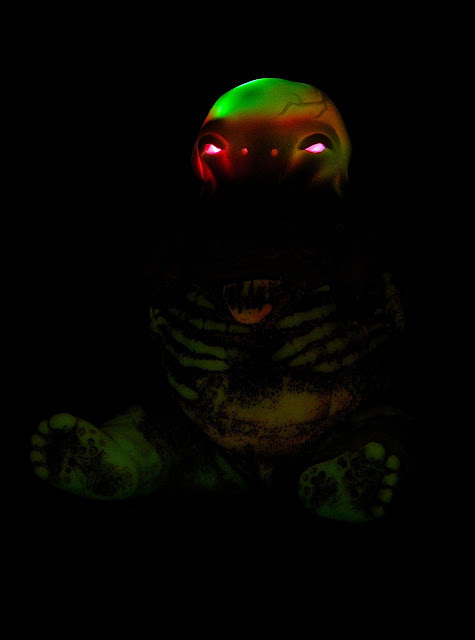 They are 6" high seated / 8 1/2" prone, glow in the dark vinyl, with a motion activated color changing LED unit in the Bacteria. Offered at $200 each. 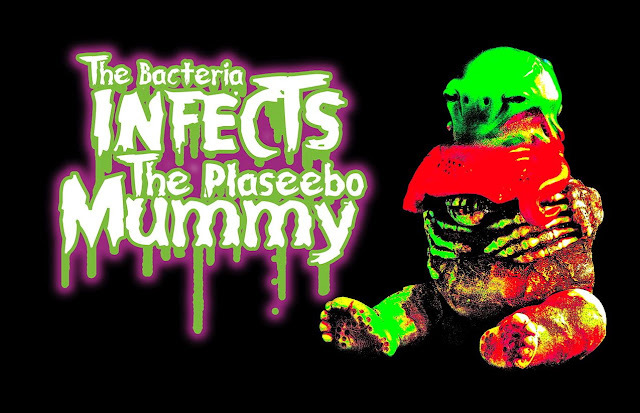 To enter the lottery for a chance to purchase one of the 5 Infected Mummies, send your Name, Address and Email address Bob at Plaseebo. ENTRY DEADLINE is Wednesday FEBRUARY 8th. NOTHING SAYS LOVE LIKE A ONE OF A KIND CUSTOM!!! 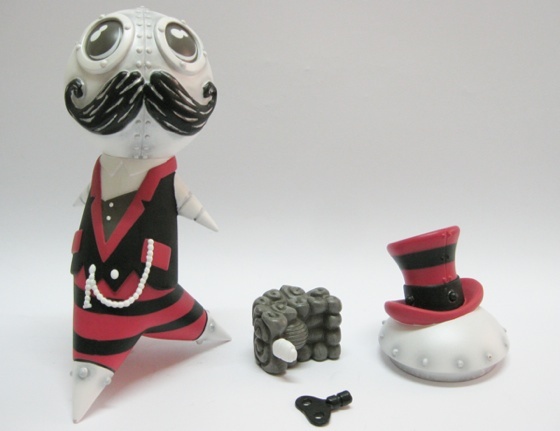 "BE MINE" is a custom vinyl toy which stands about 5" tall. The piece was created using super sculpey, then hand painted with acrylics, base, roses, and the sign was also created using super sculpey. The piece has been coated with UV protective matte finish and eyes have a high gloss finish. 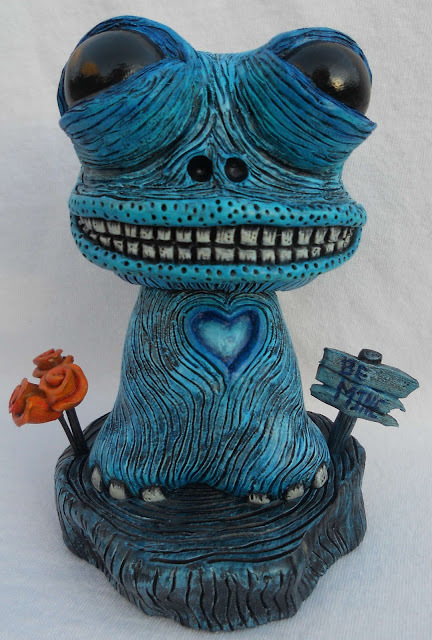 "Be Mine" can be purchased at Dave's online store. Also check out Dave's Facebook page as he is currently working on Series 2 of the "Corporate Monsters" to follow up on the sold-out Series 1.
doeeyedgirl13, originally uploaded by abby.keepman. 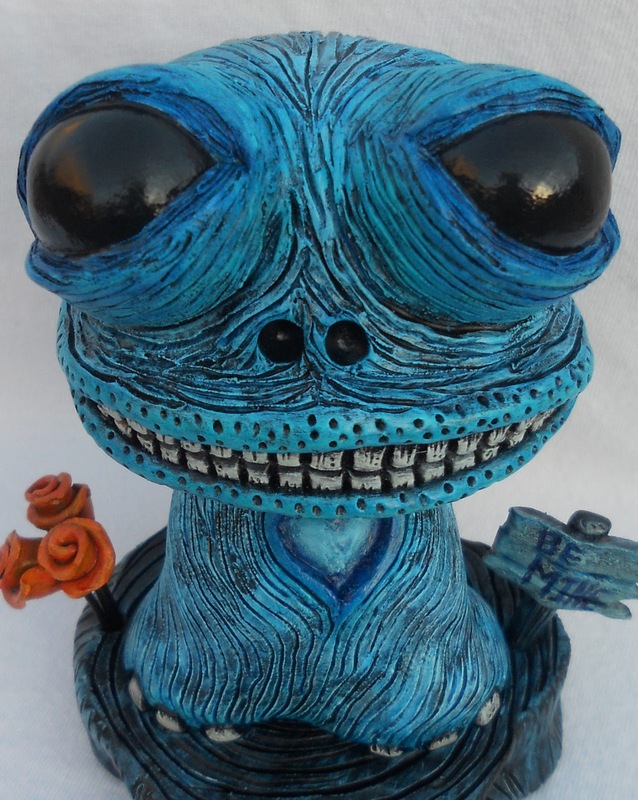 Our Texas friend NREAZON noticed I was talking about how I like seeing real bones incorporated into custom toys so she passed along these images of her 32-inch tall custom "Doe-eyed Girl" based on Kidrobot's Mega Munny platform. Sweet antlers on this one. You can follow NREAZON on Facebook or on her website, or check out the NREAZON customs we have in our shop here and here. "... and so, as punishment for your heinous crimes, I hereby sentence each of you to death by lethal injection. You are remanded to Death Row on Riker's Island to await your executions. Court adjourned." With the pounding of Judge Gerety's gavel against his desk, the fates of the five criminals were sealed. The prosecuting attorney and the D.A. shook hands as the Inmates were led away in shackles through a door in the front of the courtroom. Reporters screamed a cacophony of questions and flashbulbs went off like strobe lights as the Inmates stepped into the beat-up, white DOC van. The short ride over the bridge to Riker's Island would be the longest ride of their lives. It was over. 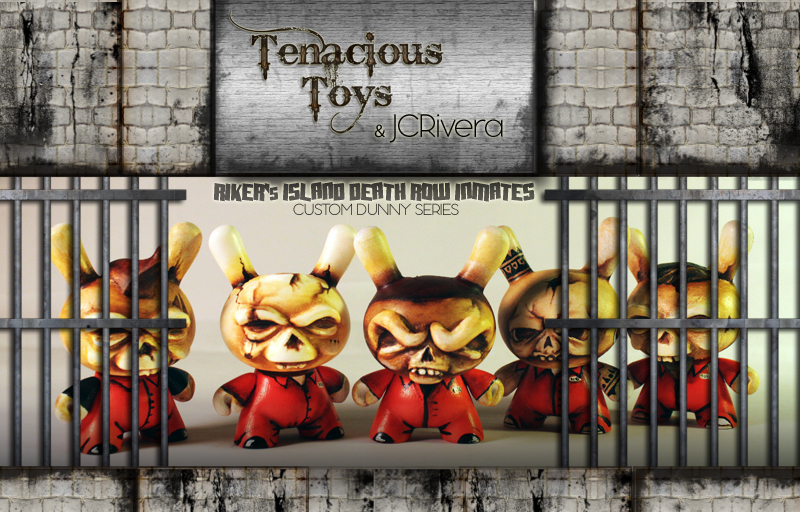 The Riker's Island Death Row Inmates custom Dunny series by JC Rivera will be for sale tomorrow, February 1, at 5pm EST. 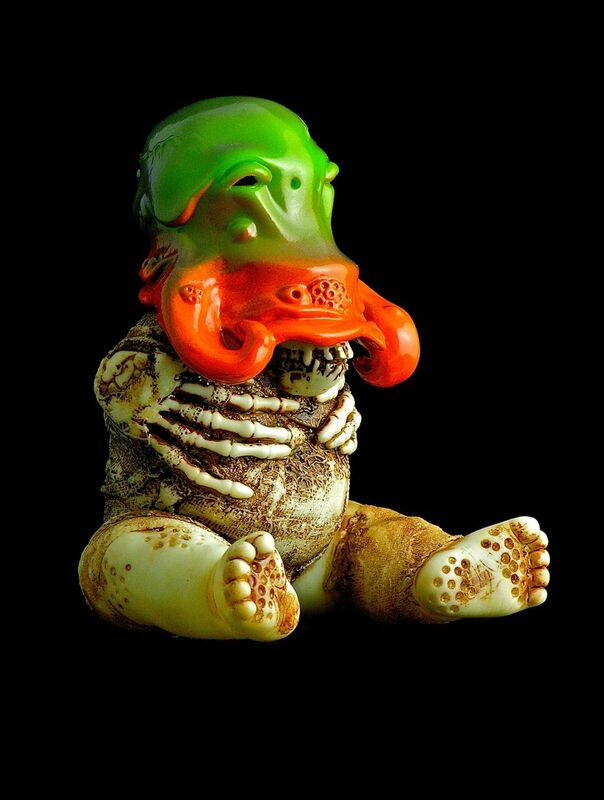 The one-of-a-kind 3" custom Dunnys will be $75 each and you'll be able to find them on our JC Rivera page. We'd like to thank JC for giving us the opportunity to work with him on another exclusive release! In 2013, after the world as we know it has ended, these 7 rusted and weathered robots came back online and quickly tooke the credit for the destruction of the planet. 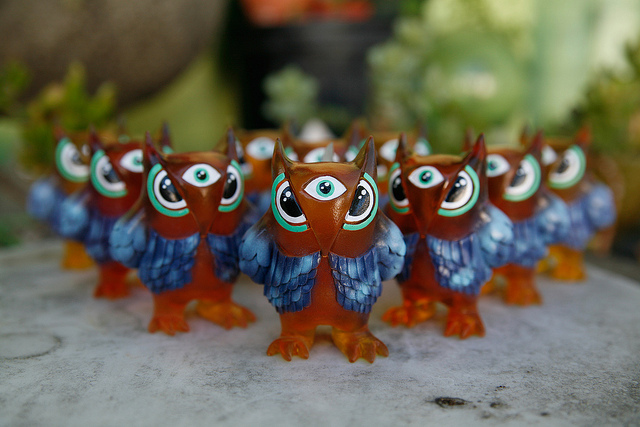 The latest Tenacious Toys exclusive artist collaboration is this 7-piece series of customs by Rusted Halo. 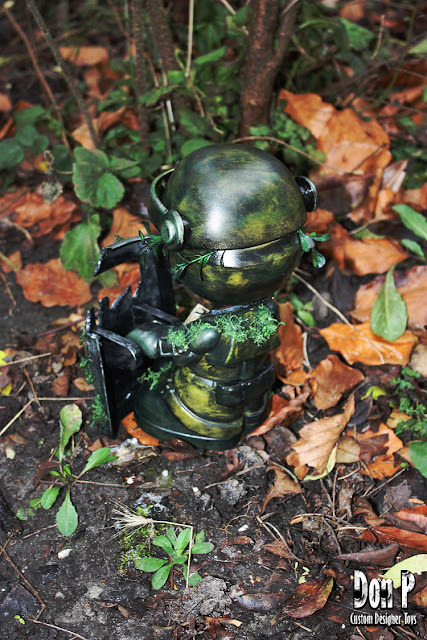 The 7 Robots of the Apocalypse are each one of a kind, hand-crafted custom 3" Dunnys. They're bagged and tagged and each comes with a metal wind-up key at that fits in the back. At only $35 each, you're really going to want to click though to our Rusted Halo page and buy one fast. One already sold. We don't expect them to be in our shop long! Beginning February 10th 2012 at 7pm EST, Four Horsemen Toy Design and TT Underground Gallery in New York City presents Toypocalypse 2: Futuretro - The Four Horsemen's second gallery show! The Opening reception of the show begins on Friday night Feb. 10th from 7pm until 10pm. Saturday Feb. 11th through Wednesday Feb. 15th: 2pm until 7pm. 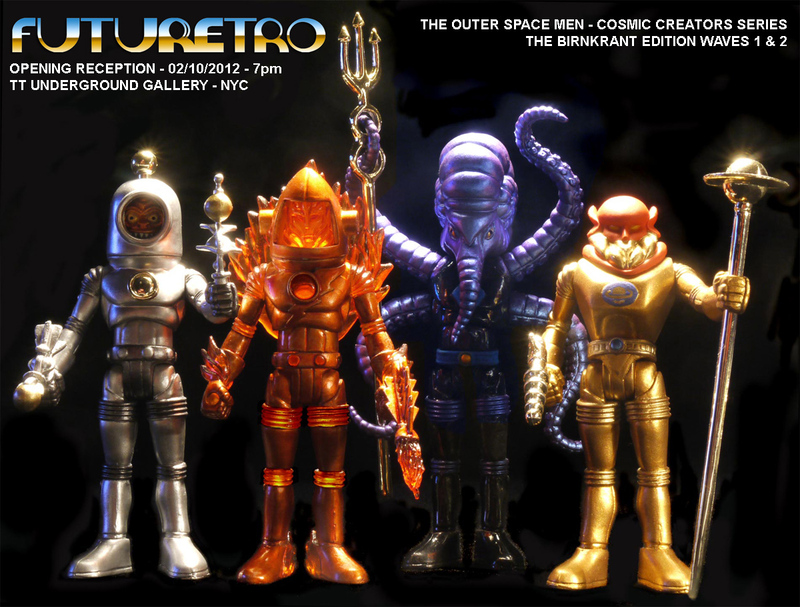 Featuring special items from the past, present and future of Four Horsemen Toy Design, Futuretro will be celebrating the 45th anniversary of the Outer Space Men acton figure line with a special edition extremely limited set of Outer Space Men figures re-vamped by the original Outer Space Men creator himself, Mel Birnkrant! The Outer Space Men Cosmic Creators series - The Birnkrant Edition figures consists of alternate versions of four of Mel Birnkrant's most famous creations. The set featuring Metalmorpho, Deep Blue Astro-Nautilus, Goldiac and Blazing Inferno will be signed not only by Mr. Birnkrant himself, but also each of the Four Horsemen. Each set of figures will also come with a special edition Outer Space Men print by fan favorite illustrator and frequent Four Horsemen collaborator, Nathan (Baena) Baertsch! Each set is $125.00 at the Futuretro gallery show. Props to my man Toygodd for letting me know about this show. Will probably view this show with him after we hit Toy Fair together. Dark Side of the Ugly, originally uploaded by rampage.toys. Above is the rainbow-painted sample of the Rampage Toys GID Ulgy Unicorn soft vinyl figure. 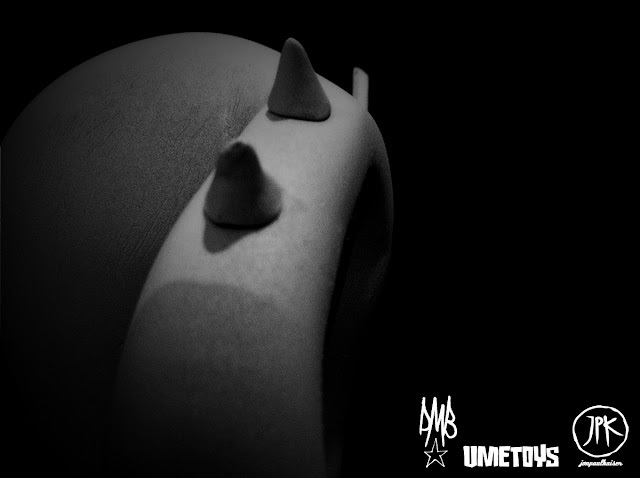 On Friday, February 3rd, there will be a pre-order for both the painted and blank GID unicorns in the Rampage Toys shop. Painted (with the artwork) are limited to 20 possible pieces (if 20 are ordered that is), and will be $42 each. GID blanks are an open order with no limit and you can order as many as you want - blanks are $28 each. Scheduled delivery is mid to late March. Pre-orders will be up starting Friday morning (EST) February 3rd, and will stay up until the following Friday (the 10th). Preorder here. Chris from Creo Design has shared with us that they have delved into producing in another medium: metal! Creo Design has set up a new shop called Amalgam Jewellery, where you can buy both rings pictured. More information on the materials is available on the Amalgam Jewellery Shop on the Shapeways site. Currently there is a cool 'nod' to the grandfather of all toys - Lego - with a super cool lego style ring and a super cool spray cap ring. 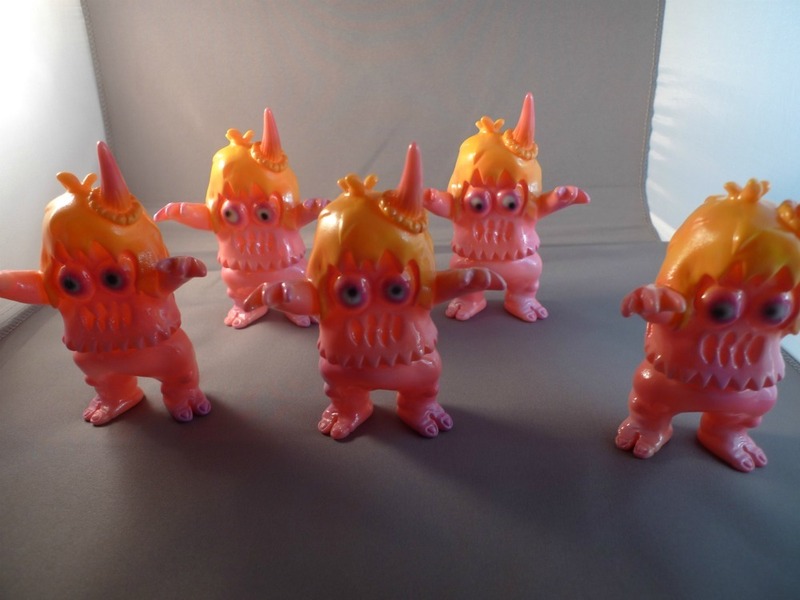 Another Rampage Toys collab: this time with Blurble- 5 psychedelic Ugly Unicorns available at the link above for only $42 each! 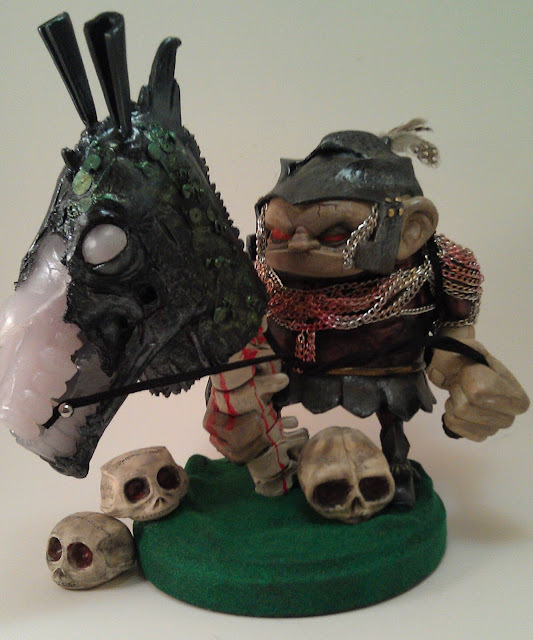 Painted by Blurble in color change and metallic Monster Kolor paints. 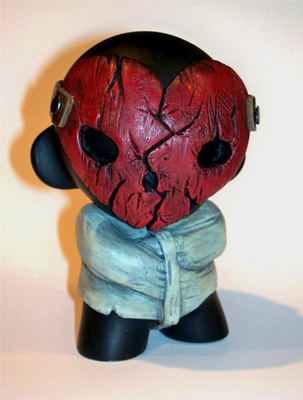 Preorder Crazy Love custom Mini Munnys by B.A.L.D. B.A.L.D. is now accepting preorders for a Valentine's Day-themed limited series of customs he's calling "Crazy Love." 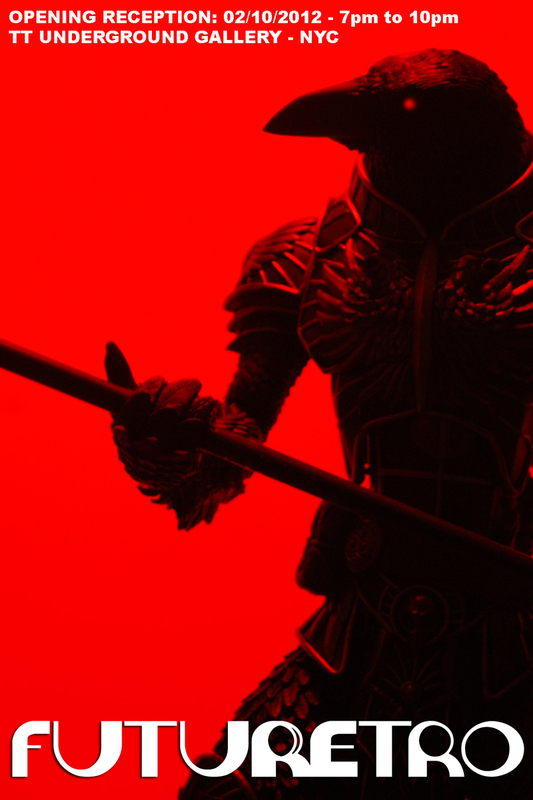 The customs will be composed of Super Sculpey, leather and acrylics. The pieces can be preordered here in the CTU store. Only 5 preorder slots available, so if you're going to pick up a special custom for that special someone, act quickly!